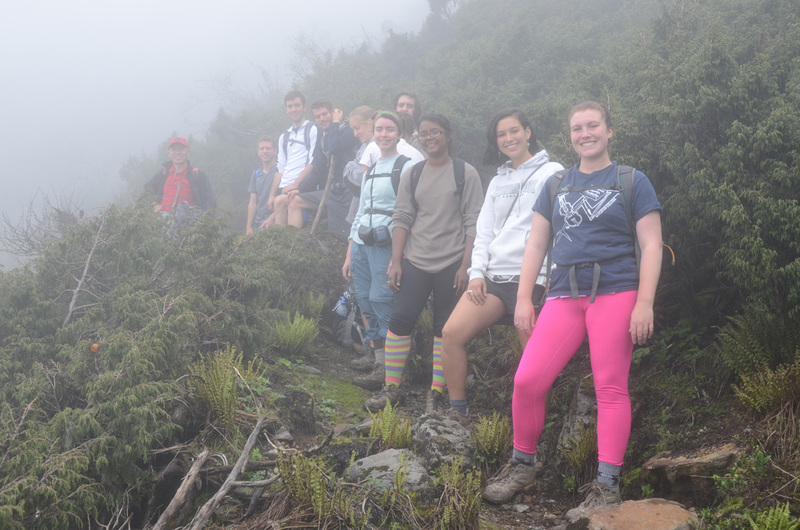 The next morning, the clouds had parted and we could all see the spectacular view of mountains and trees as we brushed our teeth and dressed for breakfast. For breakfast, we had cereal with warm milk and eggs with toast, our usual breakfast while camping. 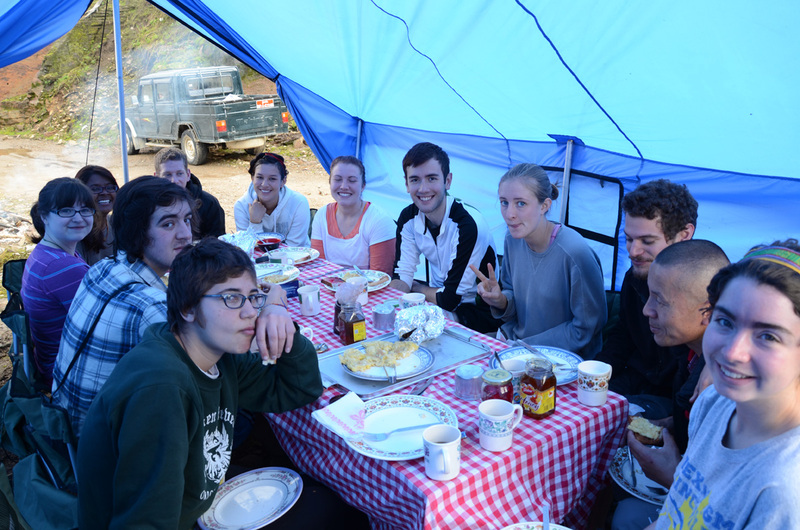 Once we finished breakfast, we all headed back to our tents to pack and put on our hiking boots. 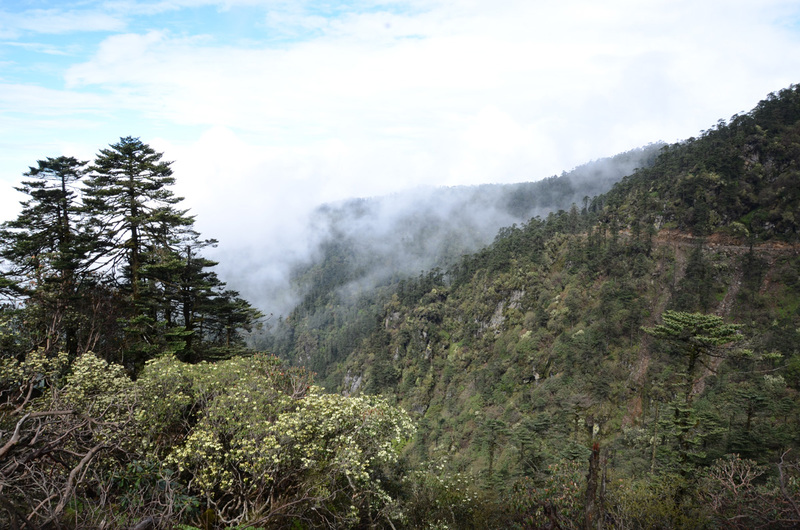 The sky became cloud-covered once again and it began misting, so Tsewang distributed a few extra raincoats to those who requested them and we headed up the trail. 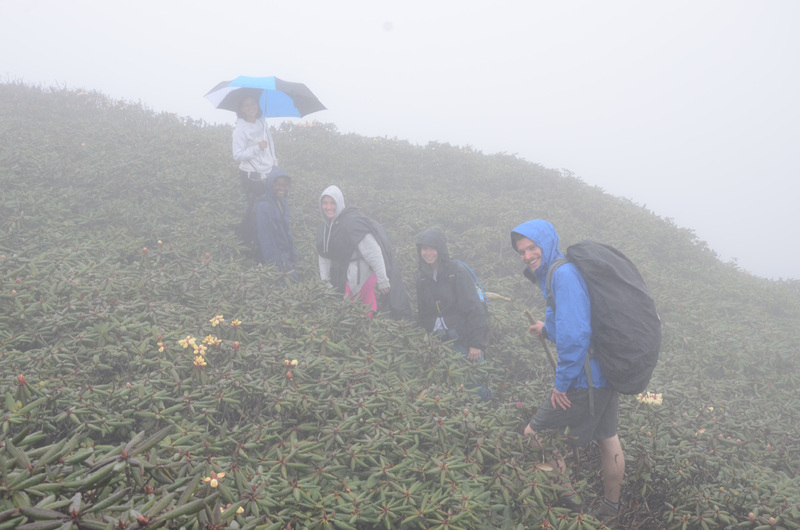 The hike was slow going because of the steep and slippery trail and the altitude. 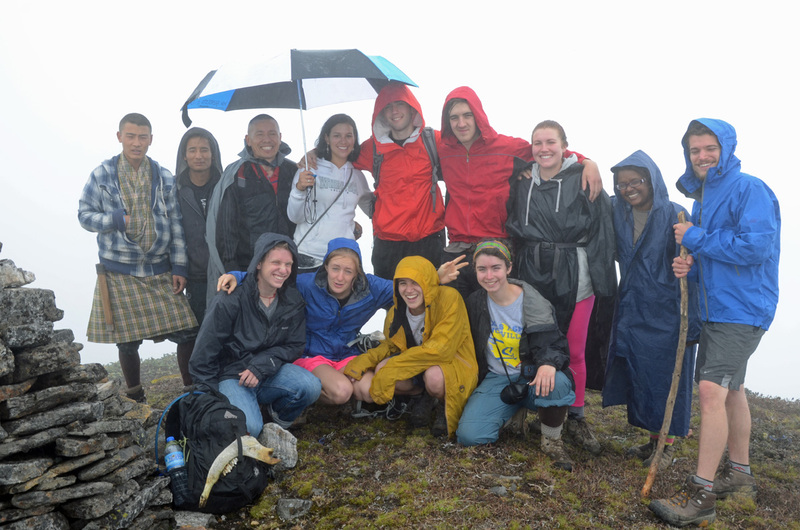 After a few hours passed, we reached the summit of Lhaptsa Teng Khang and took a group photo before descending to the pass to sit and eat lunch in the rain. 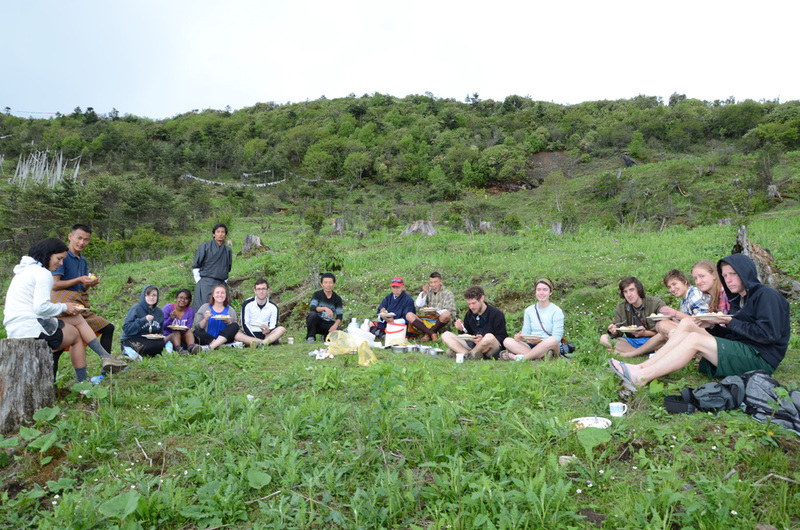 The lunch was delicious and a wonderful break from the hike. 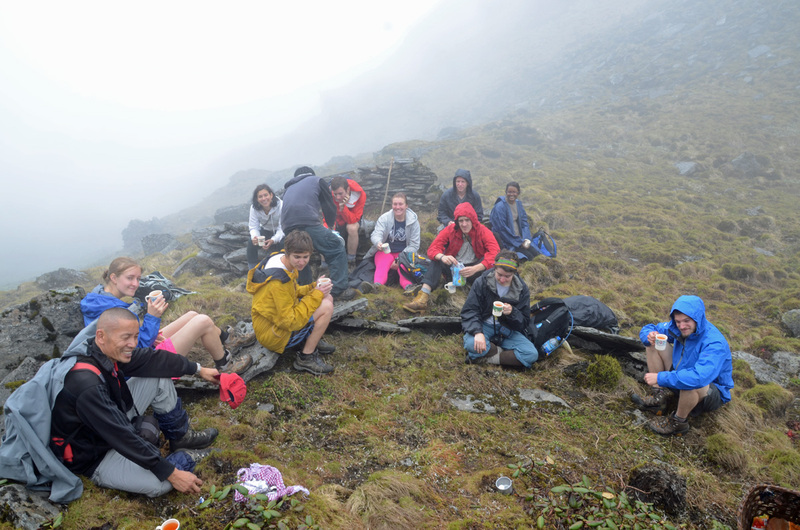 We then ate a few pieces of chocolate for dessert and ascended the second peak of our hike, Chep do Ghang, the summit of which was 4,200 meters (13,780 feet). 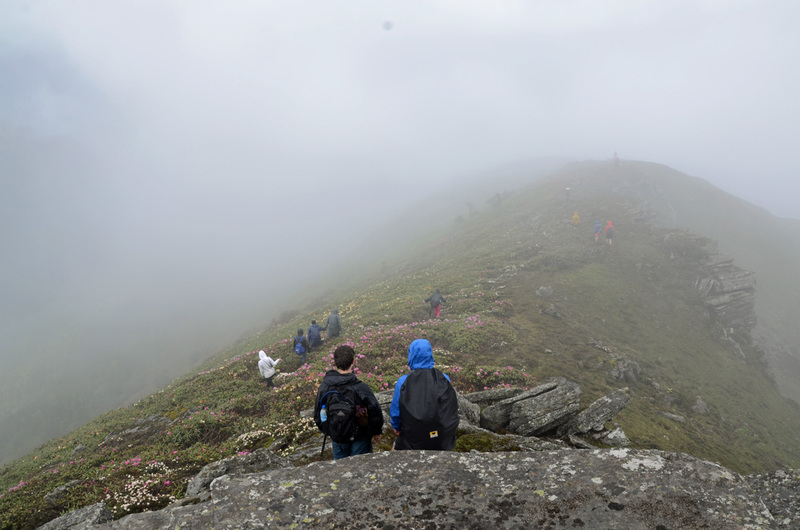 By this point, most of us were cold and wet from all of the mist and rain, but we trudged onward; the landscape around us was beautiful and covered in blossoming flowers. 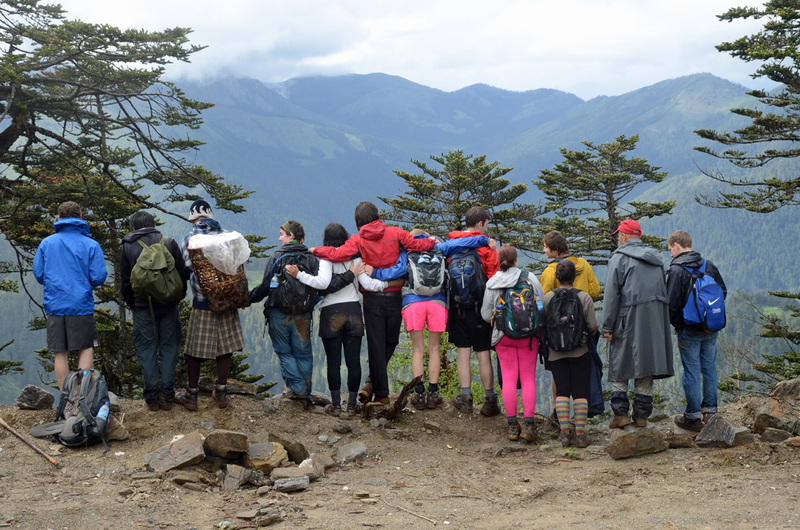 The trail was very slippery on the way down the second peak so Tsewang was helping those who needed assistance while some of the other hikers made a quick descent. 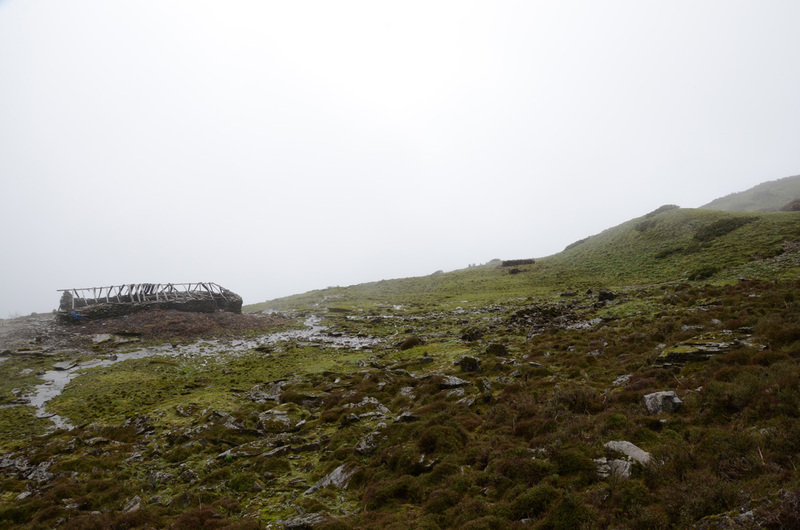 About half of the group continued to hike the trail, while the others took a shortcut and followed the dirt road. 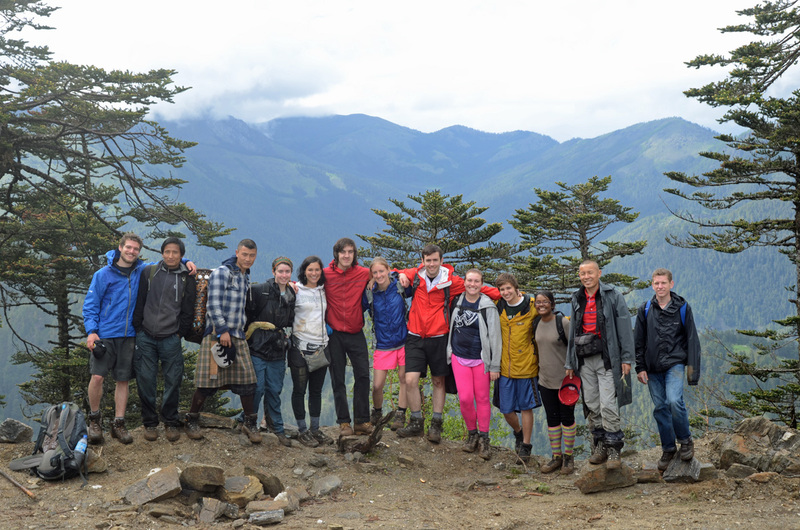 All of us met up and took another group photo after which we split up again on our journey back to Tsewang’s house; some rode in the pickup trucks back to the house while others continued hiking. 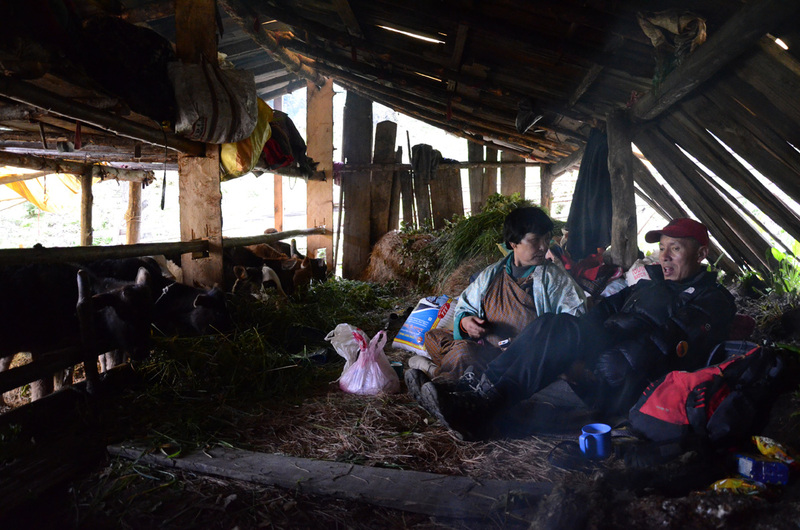 When we all finally reached Tsewang’s house, we cleaned up and warmed ourselves by the fire, waiting for dinner. 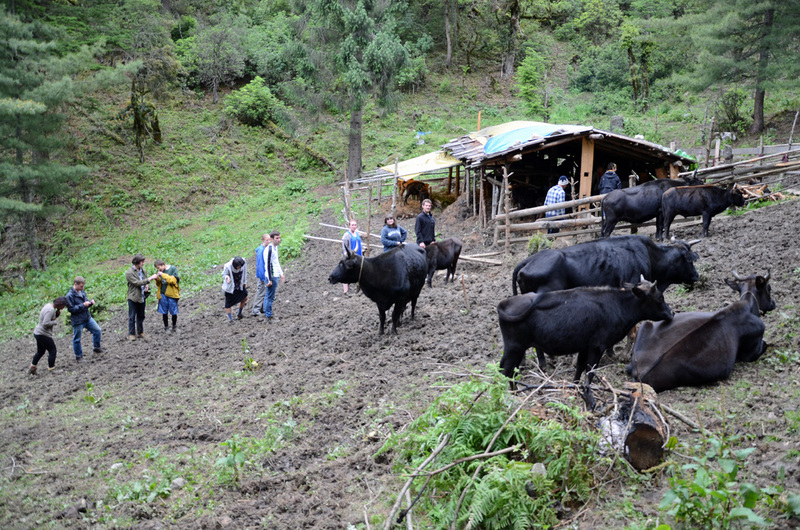 Before dinner though, we walked up to Tsewang’s Auntie’s bachim (cow shed and shelter for cattle tenders), about fifteen minutes away from the house where we tried our hand (literally) at milking cows. 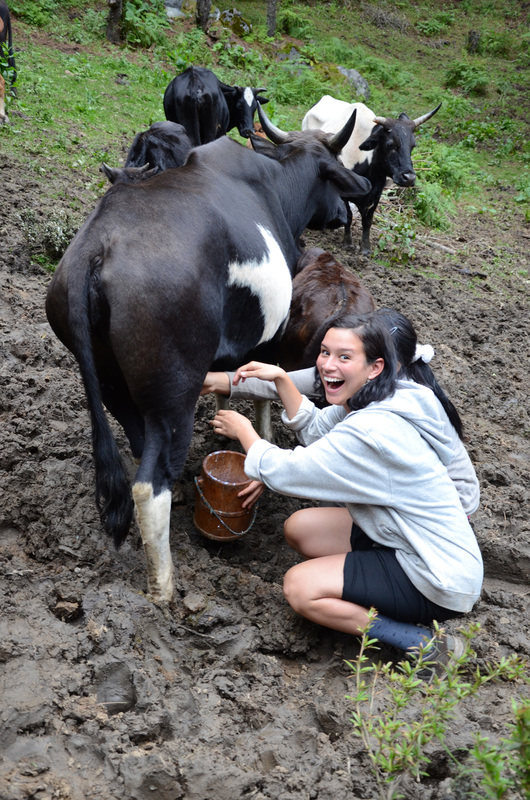 We got to pet the calves and milk the cows on the farm; we also got to try fresh cheese! 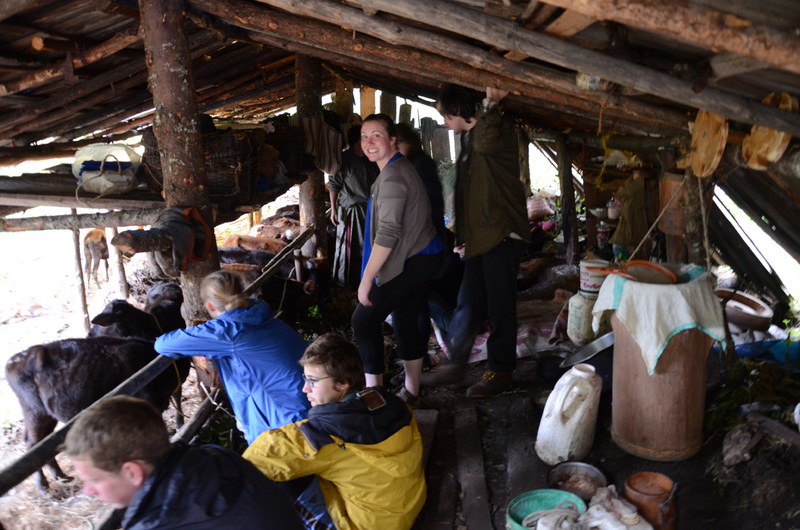 Visiting the bachim was very enjoyable for us all. We ate dinner while sitting on the floor by the fire and it was served buffet-style. 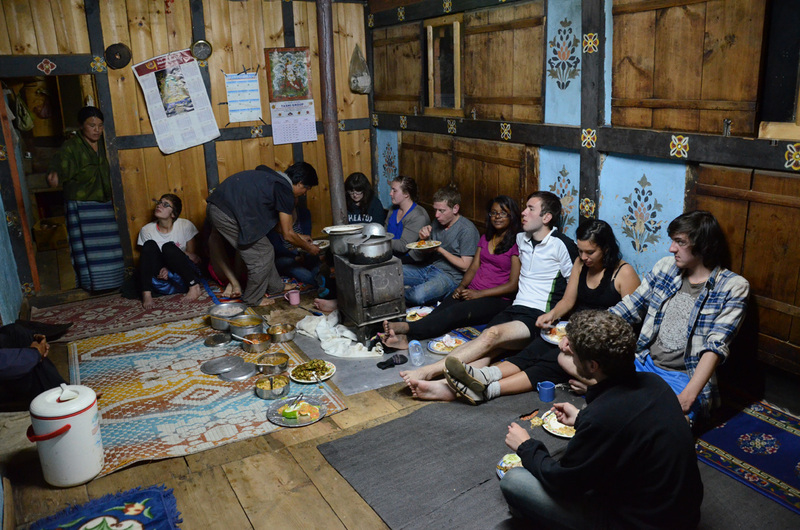 The menu consisted of red rice, daal, fish, and potatoes and we were all so glad to be eating in the warmth of the house. Once we finished dinner, some of us tried to play with the cats who were roaming the front porch of the house and others were chatting. Then it was time for bed and the girls were set to sleep in the shrine room in our sleeping bags; the boys slept in the main room where we ate dinner. Everyone was exhausted and fell asleep quickly. The next morning, we woke up, got dressed, and walked to the main room where we would eat breakfast, only to be greeted by Tsewang’s father. He did not talk much, but sat with us to eat breakfast. We ate cereal with eggs and toast again for breakfast and enjoyed the company of a brave cat who sat with us by the fire. 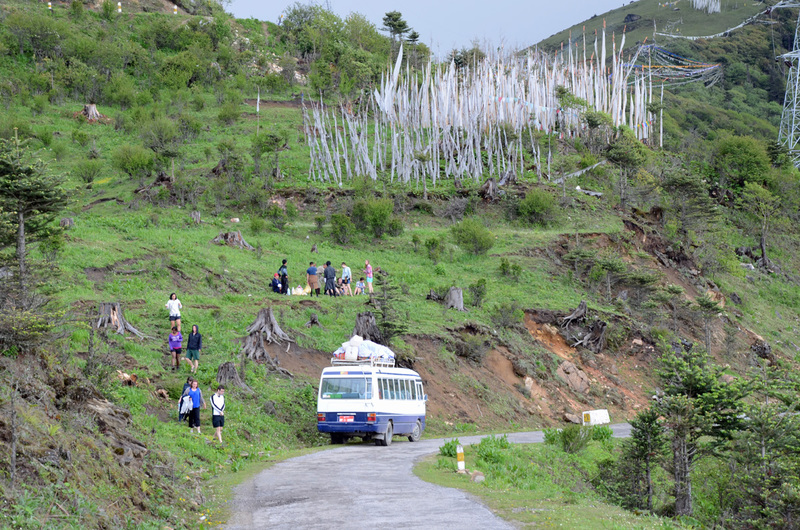 Then it was time to load our bags into the bus and drive back to Thimphu. 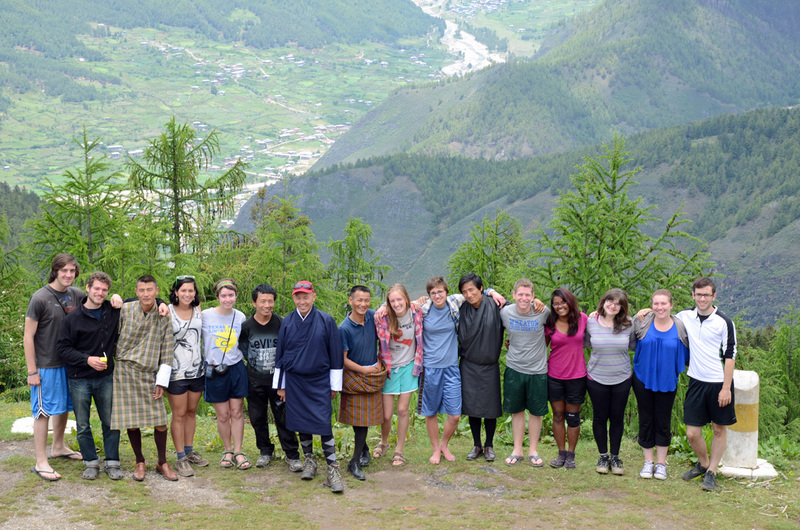 On the way, we stopped for a photo opportunity at the three hills of Haa, each representing the Lord of Power, the Lord of Wisdom, and the Lord of Compassion, respectively. 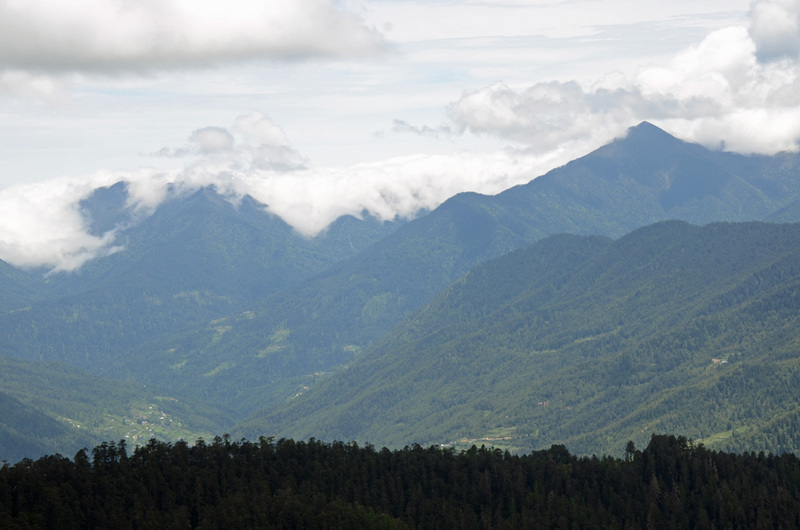 We then drove to Chele La to take a short walk up a hill to see the beautiful view of the mountain we climbed the day before and all of Paro. After the walk, we got back on the bus and drove for a few minutes to our picnic lunch location. 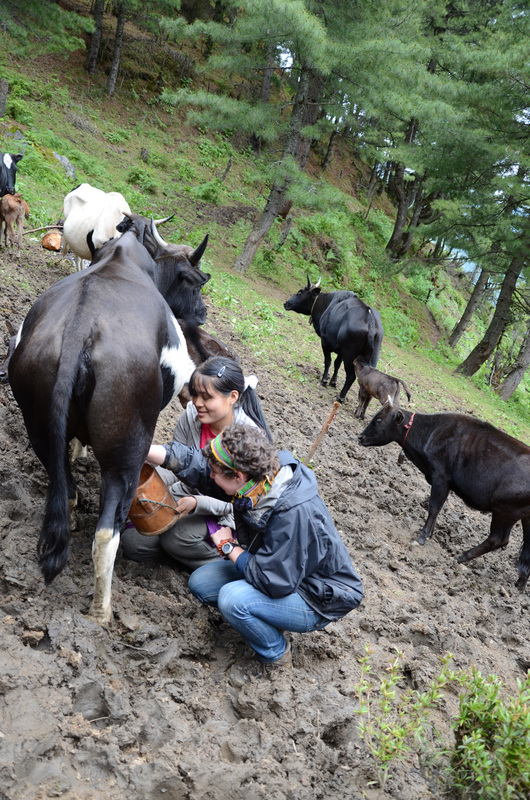 When we finished lunch, we boarded the bus and drove through Paro and back to RTC. Leki dropped us off up the hill near our dorm buildings, we said our good-byes to our loyal bus driver, and hugged Tsewang; he assured us we would see him one last time before we leave Bhutan.